Those eyes! My goodness. They are my absolute favorite feature and these awesome raptors. They are like laser beams shooting out with as bright as they are. This past weekend I spent a lot of time with one particular pair of osprey that is making their summer home in Weld County, Colorado. 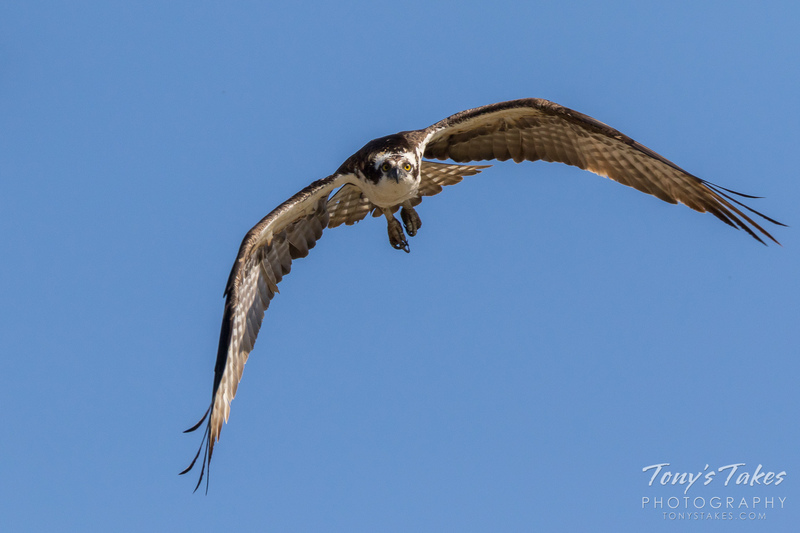 They gave me tons of fantastic shots, including this one as the female departed their nest and flew right toward me. 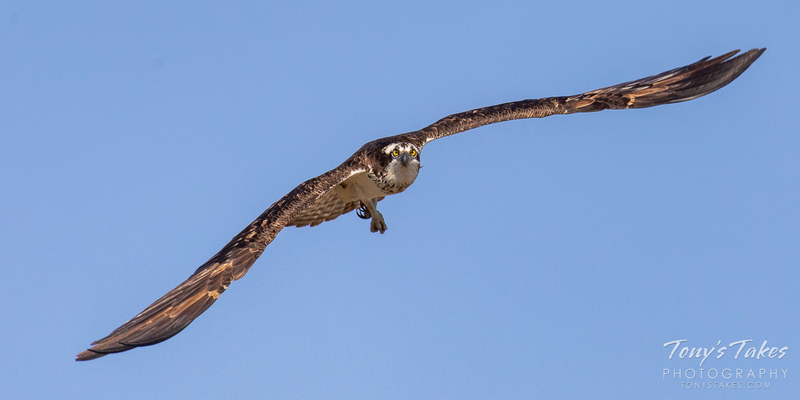 The osprey have returned to the Colorado Front Range from their winter homes along the Gulf Coast and South America. I didn’t see too many yesterday but there were a few out there including this pair that was clearly not wasting any time setting up their breeding home. Skies were kind of cruddy and overcast yesterday which was a bummer but it was fun to see them. How do you know which is male and which is female? First, like most raptors, the female will be the larger of the pair. Second, female osprey usually have a ‘necklace’ of brown which you can clearly see on her as she flies in. Springtime is fast approaching and we are beginning to see a return of some of the seasonal visitors here in Colorado. I would expect within the next couple of weeks I will see my first osprey of the season as they arrive from their winter homes along the Gulf Coast and South America. These guys are probably my favorite summertime raptor. They are very large, absolutely gorgeous and, best of all, usually quite willing to pose for pictures and put on a nice show. This particular male was one of a mated pair in northern Colorado that successfully fledged two young ones last year. Here he is seen launching right at me toward the end of April when mom was sitting dutifully on the nest. This juvenile was hanging out on a pole adjacent to the nest, soaking in the morning sun. Dad and mom were nearby and keeping an eye on things but, unlike their offspring, they weren’t interested in me. The juveniles are really cool with their white-edged plumage and orange eyes. Osprey can be found across much of North and South America, only staying year-round in Florida and the Baja California area. Winters are spent in South America and along the Gulf Coast while they summer in the northern third of North America. These beautiful raptors are known for their amazing dives into the water as they try to snag their prey. They are larger than most hawks and striking in their appearance with dark brown and white plumage and bright yellow eyes. I haven’t posted too many pics of these awesome raptors this year simply because I just have not had too many photo ops with them. This pic dates back to the end of April when this male and its mate were setting up a home in northern Colorado. They were very busy getting their summer residence ready and here, he returns to the nest showcasing those impressive talons and wide wingspan. By now, any young ones they had are likely flying or very close to doing so. Kind of a fun, panoramic crop on this cool raptor allowing you to see it up close and personal and check out that big wingspan. This bright-eyed, handsome fellow caught me a bit off guard with its launch and I was zoomed in farther than what I normally would be for a flight shot. It turned out pretty well though I think. Most of the Osprey parents are now sitting on eggs and it shouldn’t be too much longer before little ones make their appearance. Osprey gives its thoughts about Monday. I could not agree more. 😀 Couldn’t resist after what was a rough start to the workweek. It’s all downhill from here right? Not sure who was more surprised – this intruding male Osprey or me! I was observing a mated pair of Osprey at their nest in Weld County, Colorado when they suddenly became very agitated. That is a sure sign of an intruder of some kind and sure enough, I spotted another male Osprey flying around. He clearly had thoughts of booting the husband from the home, making many low, fast passes over the mated pair. The intruder flew not 10 feet over my head as he made another harassing pass at the nest, staring right at me as he did so. He was pretty backlit and I cut off the ends of the ends of the wings but it makes for a fun capture I think. These raptors are busily setting up their homes, getting ready to lay eggs and have little ones. This particular nest, as you can tell, is on top of a power pole. Not exactly an ideal type location but one which Osprey are infamous for utilizing. This unfortunately does sometimes result in bad outcomes for obvious reasons – hopefully that will not be the case with this one. I figured I would be seeing these cool raptors any day now as they return from their winter homes along the Gulf Coast and South America. Sunday proved to be the day when I spotted the first of the season, six in fact at various spots in northern Colorado. This particular guy was hanging out at St Vrain State Park, Colorado and put on a nice little show for me. After a quick patrol of one of the ponds, he returned and gave me a fantastic landing sequence, including this capture of him as he settled in on his perch. Osprey are actually a type of hawk. They are spring and summer residents of the Centennial State and other spots in the United States. 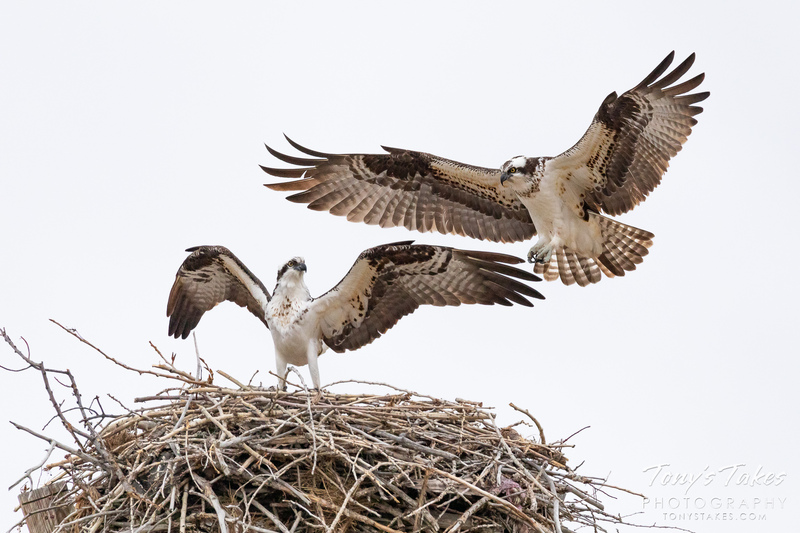 Some Osprey will take on extraordinarily long migrations. One GPS-tracked bird flew 2,700 miles from Martha’s Vineyard, Massachusetts, to French Guiana, South America in 2008.